Why use Gtechniq C0v2 Aero Coat? C0 has been formulated to minimise adhesion of foreign objects on race cars. However, it can also be used on road cars with a lifespan of up to 2 years. It offers great gloss, good hydrophobicity (110 degrees), some swirl resistance (6h) and can be applied to paint and gel coat. Please note: compared to our other coatings it C0 Aero Coat is relatively hard to apply. The product is quite viscous and requires considerably more effort when removing residue - we recommend you will need at least 10 MF1 ZeroR Microfibre Buff Cloths to carry out one application. 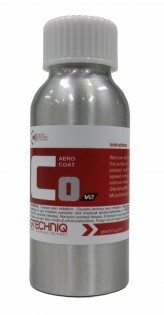 C0 can be applied as a stand-alone product or top coat for other Gtechniq permanent paint protections.